We’re currently testing adCenter using multiple browsers, and will keep you posted here on the blog as compatibility grows and we have a timeline for these updates. In the meantime, we apologize for any inconvenience the browser incompatibility may have caused you. Nice- someone up there read me. * Six days later, they said that “they had moved it up their priority list”:http://blogs.msdn.com/adcenter/archive/2006/05/19/602234.aspx of things to get done. * A few people said that supporting “minority platforms” should not be the focus of people trying to rush to release of a “product”. First off, AdCenter is not a traditional product. It is a site that allows you to advertise on MSN. Building web sites to standards is an age old (15 year old) art- one that is perfected by all kinds of developers large and small. None of them have the budget that Microsoft can afford and most, like my web sites, have no budget at all. And yet, my web site and Google and Yahoo and most others just work. This behavior seems to be _deliberate_ and _part of a much older problem_; one of choosing IE growth over everything else. * Which brings me to a related point- web sites are not built for platforms, they are built to standards. If they are built to standards, they work on every platform that supports standards. I hope this person was joking. If not, I hope this person gets help. * I am beta testing MSN’s Live eMail as well and it had brief Firefox support for a day before “it actually went away”:http://www.scienceaddiction.com/2006/05/20/msn-live-supports-firefox/ which was strange. I am beta testing Yahoo!’s new email as well and while that works fine in Firefox, it is kind of slow in any browser. * A lot of people brought up the behavior of “ExplorerDestroyer”:http://www.explorerdestroyer.com/ as a counter-point; that is, as an example of behavior that penaliizes you for using IE. I believe the Explorer Destroyer’s extreme idea of showing obnoxious messages to IE users is wrong. I wouldn’t mind giving users that read my site with IE a small and unobtrusive message in a corner saying “This site _recommends_ Firefox”, but anything more than that is more information than a visitor needs. If they wanted to be preached to about their software preferences, they would have gone to MSN. 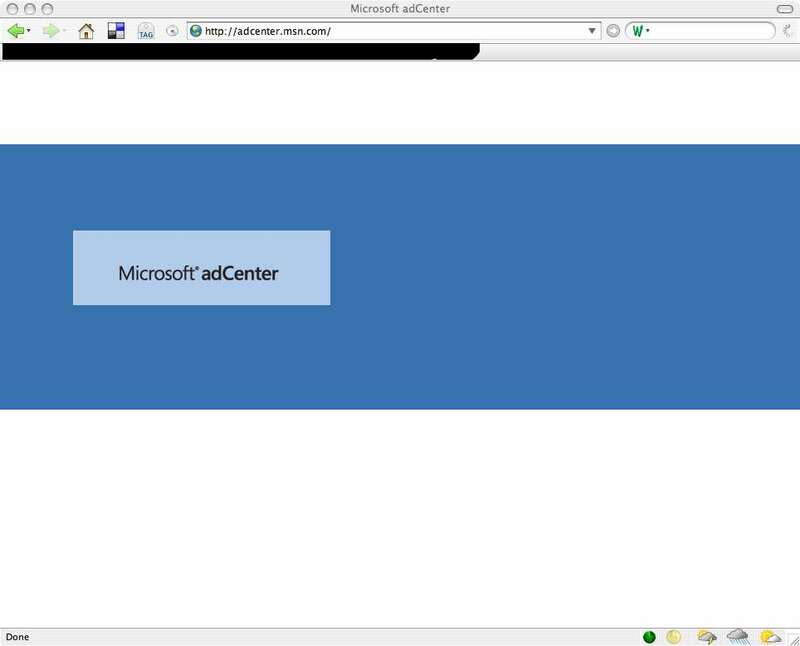 * Many people at “WebMasterWorld”:http://www.webmasterworld.com/forum114/85.htm are reporting that not only does AdCenter not work with Firefox, if users click on your ads served through AdCenter using Firefox, there may be issues with MSN being able to track them. That is, even the back-end of AdCenter- the part that serves ads- does not work well with Firefox. Understand that I am not bashing Microsoft in general. I use MSN email, have XP on two computers in my house and have used their products continuously for 15 years. What I am saying is that I have used computers for longer than I have used Microsoft products and I continue to use many other types of operating systems and software _in addition_ to Microsoft software. In those 15 years, though, I would have appreciated a Microsoft that did not put its browser marketshare before its operating system, online services and security. I am just hoping for a world where things are built to standards. “Darren points out that a lot of Ad agencies are heavy Macintosh users”:http://www.darrenbarefoot.com/archives/2006/05/i-guess-microsoft-doesnt-want-my-money.html – unfortunate for MS. Also “David Utter at WebProNews”:http://www.webpronews.com/topnews/topnews/wpn-60-20060506AdCenterNotReadyForFirefox.html reminds us that Firefox users are probably _early adopters_ and more influencial users. They are probably more discerning- solely based on the fact that they chose to select an alternative to the status quo- an MS browsers or OS. These are people you probably want to keep happy. Also a quick thanks to “rajiv”:http://rajivvyas.blogspot.com and “The Challenge Dividend”:http://www.thechallengedividend.com and “Elton”:http://eptiger.blogspot.com and “Pat Mullin”:http://weblog.patmullin.com and, of course, Digg for all the incoming links. The experience detailed in the article was frustrating, but the feedback was fun. Keep it coming and be vocal. If a web site or software or anyone else does not support your setup, be vocal.